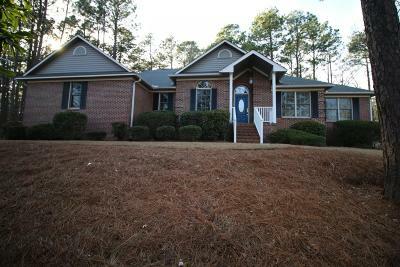 A RARE SOUTHERN PINES OASIS on a private 1.49 acre lot directly across the street from Weymouth Woods. PRIVACY - MOVE IN CONDITION - LOCATION! Privacy buffers on all sides! This superb and spacious home is in excellent condition and combines the very best attributes of Southern Pines; close to town and close to the back gate at Ft. Bragg. (1.4 miles to either destination). Many new upgrades since 2013 include: 30 year shingle roof (2019), new flooring throughout most of home (2013), including Antique Whiskey engineered hardwoods and a regraded and freshly graveled bluestone driveway. HVAC (2013). Stainless Appliances.The property includes a 1 acre area of an electric dog fence with two collars. The in ground pool is fenced and exceptionally private.